Sama Tours offer you a 19-day tour through Swaziland and South Africa from coast to coast, ending at the southernmost tip of Africa. The tour will start in Pretoria and end in Cape Town, South Africa. This tantaliz¬ing tour of South Africa combines motorcycling with culture, adventure, and South Africa’s most beautiful destinations. You start in Pretoria, where you enjoy a motorcycle safari through a Big 5 game reserve. From here, you make your way through the twisting mountain passes of Mpumalanga, visiting the Shangana cultural village, and the world-famous Kruger National Park, followed by the Kingdom of Swaziland. Next up we visit the spectacular Lake Jozini and enjoy a Safari into Tembe Elephant park before making your way to Cape Town hugging the South African coastline all the way and stopping to explore the Tsitsikamma, Garden Route, Route 62, Cape Agulhas and Cape Point. Ride to Mpumalanga, the "bikers' paradise"
During this tour, you will be accommodated at three or four-star lodges on a bed and breakfast basis. Welcome to South Africa. You can arrive at any time on day 0 as your motorcycle tour will officially start on day 1. Tonight’s accommodation is included as your bonus night. A friendly Sama Tours' representative will meet you at the airport and transfer you to your hotel in Pretoria. This morning, Sama Tours will hand over your motorcycle to you and sign all the paperwork. After that is complete, you will have a tour briefing and then the fun begins. You will start off by taking a tour of a small township just north of Pretoria to experience all the vibrant colors, sounds, and tastes of Africa. You will have lunch in a tavern in the township, followed by a visit to a rural motorcycle mechanic shop. Afterwards, you will enjoy a guided motorcycle ride through a big 5 nature reserve. Rhinos, giraffes, impalas, and wildebeests can all be spotted from your motorcycle. Tonight, you will have a welcome dinner in an African boma. Welcome to Africa! Today, you make your way up into Mpumalanga - an area known to local riders as “Biker Paradise”. As you head up north, the roads become mountainous with beautiful views of the rolling hills below. A highlight is riding Long Tom Pass. Enjoy the great twisties and arrive in Hazyview in the last afternoon. Make your way down to Mpumalanga (an area known to local bikers as “Motorcycle Paradise”) where the roads here are beautiful and curvy, and there are so many great viewpoints, rock formations, and waterfalls along the way. The route will include stops at Bourke’s Luck Potholes, the Three Rondavels, and God’s Window. Although there are so many attractions signposted along the way, you may just wish to pull off and experience a few of them. You will arrive in Hazyview in the late afternoon. Tonight, you will enjoy a traditional African meal and African dances at the Shangana Cultural Village. Today, you will bid goodbye to the motorcycles and board a game viewing safari vehicle which will transport you to the Kruger National Park. This world-famous wildlife reserve is home to the BIG 5 and is roughly the size of a small country. The vastness of the park allows ample opportunity to view wild animals in their natural habitat. You will have a full day to spot lions, elephants, birds, and many different species of animals. In the afternoon, you will return to your hotel in Hazyview where you can relax around the pool or take part in any of the optional activities in the area. After breakfast, you will depart for the kingdom of Swaziland, home to the friendly Swazi people. After border procedures (passport and possibly visa required), you will weave your way along winding country roads and mountain passes. Today, you will visit Swaziland’s own glass factory (Ngwenya Glass) and see the world-famous Swazi candles being handcrafted at Swazi Candles. There are many excellent restaurants, pubs, and craft markets in the Ezulwini Valley where you will overnight at an excellent country lodge, with its own magnificent restaurant on a wooden deck with spectacular views. Today, you will make your way through Swaziland to South Africa’s Zulu Kingdom, the homeland of the proud Zulu nation. In the late afternoon, you will arrive in Lake Jozini. Your lodge is in the hills overlooking the spectacular Jozini Dam and surrounded by wildlife parks. Enjoy a drink on the deck while watching another spectacular African sunset. Today, you'll be up bright and early for a Safari into Tembe Elephant Park. Here, the Big tuskers roam - with African Largest Ivory Tusks. This is also home to the Big 5 and your local guide will make the bush come alive. You will return to the lodge in the early afternoon and are free to relax at the pool, book an African spa treatment or even try your hand at Tiger Fishing. After breakfast, you will travel down the KwaZulu-Natal coastline through Durban to the South Coast holiday town of Port Shepstone, where you will head inland via a beautiful mountain road to the spectacular Oribi Gorge Nature Reserve. Tonight, you can witness the magnificent African sunset over the breathtaking Gorge. After an early breakfast, it is time to head for the Wild Coast, where the famous Madiba which is former president Nelson Mandela, was born. You will see why this region is called the Wild Coast. Endless unspoiled sandy beaches that stretch as far as the eye can see make this destination well worth a visit. This morning, there will be an optional ride to Hole in the Wall, along the most spectacular dirt road that meanders up and down beautiful winding mountains overlooking the sea. The rest of the day may be spent relaxing on the beach, learning to surf, or taking part in any of the adventurous activities on offer. Sit back relax and let the Wild Coast sink in. After an early breakfast, you will bid the rolling hills and sea cliffs of the Wild Coast farewell and make your way inland following the N2 to East London. You will continue along the coastal road to Port Alfred, a beautiful little mariner town with stunning sea views and good places to eat. In the late afternoon, you may wish to take a walk over the beautiful sand dunes the dominate Port Alfred's beachfront. Today, you follow the coastal route to the start of the famous Garden Route. You ride into the Tsitsikamma National Park and sleep in wooden cabins overlooking Storms River Mouth. You will have the whole afternoon free to explore this beautiful National Park. Storms River is the start of your famous “Otter Trail” and you can walk part of the hike down to the breathtaking suspension bridges between the sea cliffs. Enjoy an evening spent in this very unique camp overlooking the Indian Ocean. Today, you ride the world-famous Garden Route. Your first stop is the spectacular Bloukrans Gorge. Bloukrans is home to the world Highest Bungee Jump - 216 meters of pure adrenalin. Next up, you ride into Knysna and marvel at the beautiful Knysna Heads. From here, riders can either take the dirt or tar route into the mountains. Both options include unbelievable views and spectacular mountain roads, that the Garden Route is known for. You will arrive in Oudtshoorn, the Ostrich Capital of South Africa, in the late afternoon. This will be your home for the next two nights. Today is a rest day, but there is so much to see and do! You will have a guided tour of the Cango Caves with its beautiful stalactites and stalagmites and a tour of a working Ostrich farm, where you will get to feed, touch and hug Ostriches. 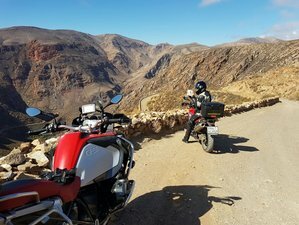 For those that would like to do some more exciting dirt riding, there will be an optional ride over the famous Swartberg Pass; this is a bucket list ride for adventure bikers the world over. This afternoon, relax and enjoy the warm Karoo hospitality that this area is known for. This evening, you will be treated to a traditional Ostrich Braai (BBQ) that will tantalize your taste buds. After an early breakfast, you will make your way to the start of Route 62. The road winds through the Swartberg mountains and beautiful foothills in their valleys. You will make your way down to Cape Agulhas, the southernmost tip of Africa at 34° S and 20°. Here, the ice-cold waters of the Atlantic Ocean meet the warm Indian Ocean, creating a turbulent mixture of untamed beauty. There is always a party at Cape Agulhas, as you will celebrate reaching the most southern point of Africa. There are great photo opportunities at the southernmost tip. Today, you make your way to Cape Winelands. En-route, you will stop in at Hermanus, the whale watching capital of South Africa and also at Bettys Bay, where you will get up close to penguins living on the beach. The Cape Winelands is a beautiful landscape of vineyards, mountains and fruit farms. The riding is also world-class with some exciting mountain passes. Tonight, you will sleep in the heart of the Winelands and enjoy some local wine tasting. Today, you make your way to Cape Town, South Africa’s Mother City. Today is the highlight of the trip as there are beautiful coastal views with twisting roads cut into the sea cliffs virtually all the way. You'll start the day with a ride to the “Simonstown” - a working navy base. After that, you make your way to Cape Point - the most South-westerly point of Africa (with views of the Cape Peninsula). Next up, you ride the famous Chapmans peak drive past False Bay and then, head over Signal hill into Cape Town, where you'll celebrate the end of an amazing tour at one of Cape Town’s best restaurants. What a ride! Sadly, your tour of South Africa has come to an end. Sama Tours guarantee that you will take home loads of awesome photographs and fond memories of South Africa the warm people you have met. Transfers will be arranged to the airport. This tantalizing tour of South Africa combines motorcycling with culture, adventure, and South Africa's most beautiful destinations. You will start in Pretoria where you will enjoy a motorcycle safari through a Big 5 game reserve. From here, you will make your way through the twisting mountain passes of Mpumalanga, visiting the Shangana Cultural Village and the world-famous Kruger National Park, followed by the Kingdom of Swaziland. Highlights along the route will include breathtaking views at Oribi Gorge, Hole in the Wall in Coffee Bay, riding ostriches and exploring the Cango Caves in the Garden Route, and visit Cape Agulhas, the southernmost tip of Africa. You will be served 18 breakfasts, 15 lunches, and 17 dinners. All items not mentioned in "What's included"
All meals other than those specified in "What's included"
All Entrance fees other than those specified in "What's included"
Please book your flight to arrive at O. R. Tambo International Airport (JNB). Sama Tours will pick you up from the airport. Transfer from and to the airport is included. (Departure airport will be Cape Town International Airport (CPT) and transfer to the airport is included). The tour starting on October 4th, 2019 will start in Cape Town and go to Pretoria (reverse direction).